McCain-Palin have nowhere to go now but down, and I will tell you exactly how this will happen. They can run away from President Bush, but they can't run away from the Republican Party. 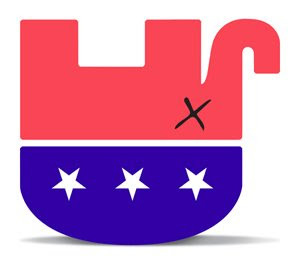 The Republicans will be regarded from now on as "the party that wrecked America." Over the weeks ahead, as carnage in the economy and the financial markets ramps up, it will become increasingly clear. But Kunstler and many others don't "round the bend" of their own logic. What happens when the "party that wrecked America" gets rewarded with the Oval Office for four more years? Logically, we are left with the "Voters who wrecked America", or "The People that wrecked America". What then for a patriot? Passivity in the face of the wreckers? Sundering the ties that bind us to them? There must be a vanguard party who sees as its first task to corral The People who wrecked America. No more farm subsidies, no more jobs, no more pensions, no more middle class lifestyle; in an irony of fate, that vanguard party is the Republicans!!!! We who oppose them in order to defend the average slob should as Ayn Rand so banally put it, shrug. And do so with some fanfare so that the effect is not lost on everyone. A completion of Kunstler et.al.s tactical advice.